A senior political official explained the diplomatic importance of the American recognition of Israeli sovereignty over the Golan Heights. "It's a major breaking point for Iran that the US gives us fill backing. It's powerful backing and establishes a principle - Israel can indeed hold territory occupied in a defensive war. This is important from a historical and diplomatic perspective." 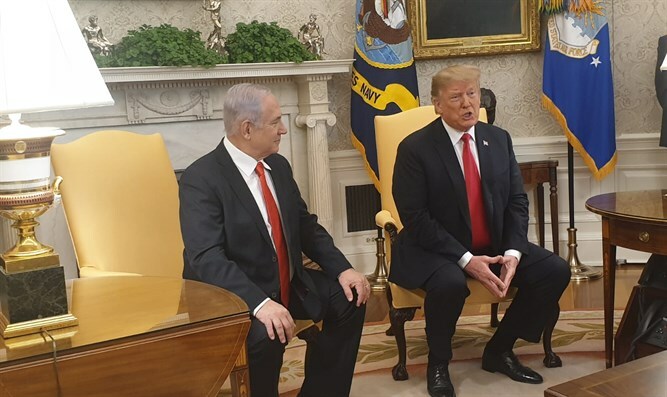 On Monday, President Donald Trump signed an executive order, instructing the State Department to formally recognize the Golan Heights as Israeli territory. Israel captured the Golan during the 1967 Six Day War, but refrained from annexing the area until 1981, when it passed the Golan Heights Law, applying Israeli law directly to the Heights. At the time, the US, USSR, United Nations, and most other world powers refused to recognize the annexation.